Here are my favorite items to give as gifts. The Tilley hat, favorite therapeutic hand cream, inexpensive gloves, Garden Design Magazine, plants as gifts and pruning tools. You can buy a Tilley hat at REI, Bonnet in NW Portland at Bonnet or on line. 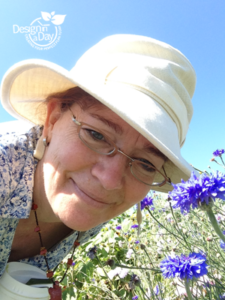 I love my summer (Hemp fabric) Tilley hat because whether it’s picking peaches or playing with my dog, my hat stays on, it’s easy to wash. I am around a lot of dirt and it is still a cream color. It protects my face from the sun (is recommended by some dermatologists for that purpose) and it’s not too hot to wear in the summer. 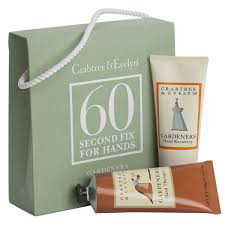 My favorite hand care product is Evelyn and CrabTree 60 second fix for hands. It has 2 products, the Ultra Moisturizing Hand Therapy and the 2nd product called Hand Recovery. There are more heavy duty hand products out there but this one has a light fragrance and penetrates the skin. It’s therapeutic. I handle art supplies and garden so I like a good hand product. Andalou Naturals Hand Cream is also nice but doesn’t penetrate the skin nearly as well. I love having A LOT of gloves. I’m a person who misplaces gloves and as a child I resented that nursery rhyme about the kittens who lost their mittens because clearly I was going to be one of those kittens. I have 20 pairs of inexpensive work gloves. Gloves are great stocking stuffers. 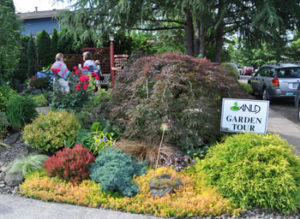 Garden Design magazine readers are garden enthusiasts! They love the full-length stories (some run 10 to 20 pages to include lots of glorious photography) on plants, gardens, and design ideas for you to put to use—all presented without ads. There are no ads in Garden Design. Yes, you read that right—no ads. Just 148 pages of beautiful gardens and plants delivered to you each quarter. These are more like books. I’ve given this magazine to gardening clients and they are over the moon and tend to subscribe on their own the next year. Itoh Peonies are so popular this year (2017) that wholesale and retail sources sold out completely. 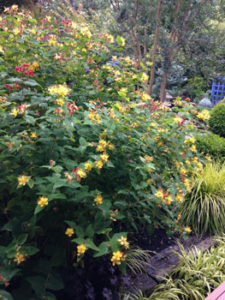 The variety called ‘Cora Louise’ was the most popular and the first to be gone from retail and wholesale sources. 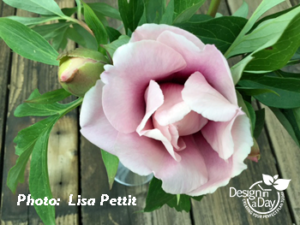 Why are Itoh Peonies special? They are tough enough for low maintenance landscapes so they are not just for serious gardeners……..and serious gardeners have simply lost their minds over these beautiful and sturdy stemmed plants. If you have a gardener in your life who loves big colorful flowers……..this gift will express your love for years. 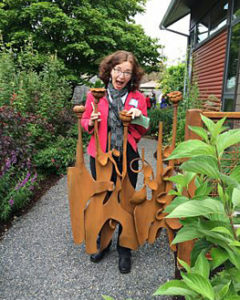 A gift certificate to a local retail nursery with a photo would do it. Expect to spend $125 to $150 for a 5 gallon plant. 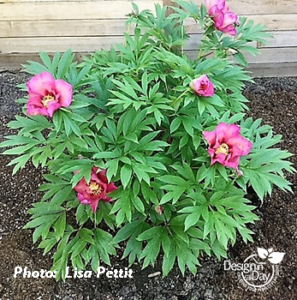 Here are links to Portland Nursery gift card, Cornell Farm gift card and a video explaining more about Itoh Peonies. Another popular plant for gardeners that you can buy in December are Hellebores and the big garden nurseries will have these for sale starting in December through March. These are somewhat toxic so don’t leave them where small children or pets can get them. Pruners – I love Felco and Corona tools the best. Cheaper but very lightweight pruners and clippers from Fiskar are popular too. Here is a good one called PowerGear. Felcos are for the gardener in your life. I still love my #6 Felco hand pruner for smaller hands and think they fit most women better than a #2 Felco hand pruner. Utube video on how to select ergonomic pruning tools for people who want to learn how to prune their trees and shrubs. The right tools make a big difference in the outcome for your plants. Join us for our free annual Holiday Open House as we kick off the solstice season. A warm, welcoming fire in our cozy Audubon House hearth will beckon winter revelers. Delicious treats and warm beverages will chase away the winter chill. Take a short hike in the Nature Sanctuary and visit with the Education Birds! Sauvie Island Coffee, Spiced Tea & Hot Cocoa plus holiday food treats. Swift Cider is inspired by the migration of Vaux’s Swifts that occurs during the peak of the annual apple harvest. They’ll be bringing their delicious ciders to our event for a tasting and give you the opportunity to buy bottles to take home for the holidays. From 10am-2pm, Audubon Nature Journaling instructor, Jude Siegel, will join us with her beautiful and affordable avian watercolors which are ready-to-hang and make great gifts. Get acquainted with Corinne Hodel of Autumn Fern Designs. The creator of colorful sun-print shoulder bags for active people and fun pottery for home and garden will be with us all day. Meet the authors (hours vary): Paul Sullivan, the popular longtime leader of Audubon Birding Weekends has a new book, The Birds of Rummel Street, chronicling 23 years of backyard bird sightings. He’ll be on hand all day to sign copies, talk about the value of record keeping and share stories about this project he shared with his partner, Carol Karlen. 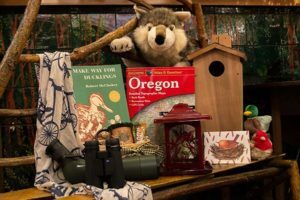 Margo Greeve, author/illustrator of Oregon’s Special Animals is children’s art instructor. Her delightful book contains both her drawings and poems. She will be on hand to sign copies from 10am-4pm. Meet the artists from 11am-4pm: Margaret Greene of JourneyWay, LLC is the creator of beautiful fused glass feathers to decorate your walls. Each feather has the size, detail and coloration of a specific bird species. Corinne Hodel (see Saturday event) also returns. Free Afternoon Music: In Heron Hall from 12-4pm, enjoy the toe-tapping tunes of the Oregon Bluegrass Association.